Want To Know The Value Of Your Chevy In Less Than 60 Seconds? My son walked in to the office the other day with an old Chevy part in his hand and asked, "Dad, how much is this worth?" I looked at the part and then back at my son and said with a smile "Don't know, guess you're gonna have to sell it to find out!" I'm actually quite amazed at the direction the entire hobby has gone. 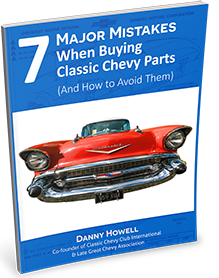 If you had asked me 40 years ago when I started Classic Chevy to project the value of Classic Chevy's today, I would never have guessed they would be as valuable as they are. Probably one of the most frequently asked questions I get over the phone is someone asking me to give a ball park figure on a certain old Chevy they are thinking of buying. Have fun! But remember, this is just to give you a ball park price. If you want to get a definite value of your Chevy then I would suggest having someone like myself appraise the car for you. I love old Chevys and have traveled half way across the continent to help people appraise their Classic Chevys so don't let distance be an issue. If you would like to learn more you can call the office and ask for me (407) 886-1963.